If you have missing teeth or need to undergo an extraction, dental implants restored by Windsor dentist Dr. Steven Lipman are an excellent option to return the function and appearance of your smile. Dental implants are small titanium posts surgically implanted in the jaw to simulate tooth roots. Once they heal and stabilize, Dr. Lipman restores implants with a natural-looking, custom-crafted denture, crown, or bridge. Unparalleled in strength and durability, implant-supported restorations allow you to eat, speak, and laugh with confidence. Implants also benefit your oral health by helping to maintain bone mass in the jaw. To learn more, schedule an appointmenttoday. After your implant treatment is complete, your dental prosthetic will never slip or shift out of place. Your restoration will look and feel natural, and do anything your own teeth could—including eating foods like steak and corn on the cob. 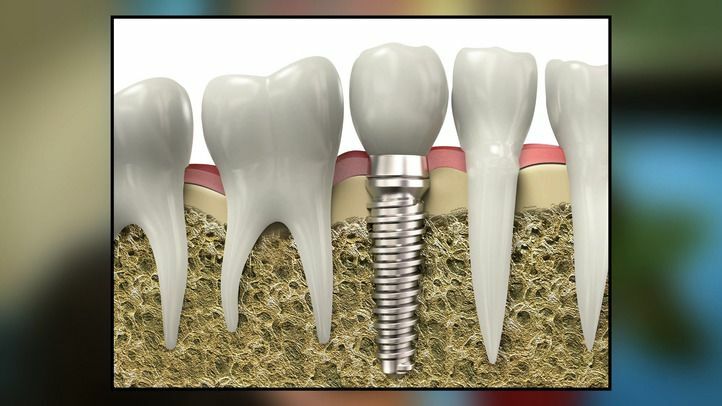 Surgically inserted in the jaw bone, dental implants are titanium posts that serve the function of a tooth root. Dr. Stephen Lipman works with an outstanding implant dentistry team who can place the posts and then restore them with a crown, bridge, or denture. Many patients choose dental implant-supported restorations for their incredible stable, durable, and lifelike results. If you wear dentures that are loose or uncomfortable, or if you do not want to have good tooth structure removed to secure a traditional bridge, then you may be a candidate for dental implants. Improvements in implant dentistry are allowing more patients than ever to benefit from this technology. In the past, patients with insufficient bone quality were not good candidates for dental implants. Today, bone grafting is a routine procedure used to supplement a patient’s jaw to successfully support implants. Candidates should also have good general and oral health. If you have decay or gum disease, it will need to be addressed with general or restorative dentistry treatment prior to receiving your dental implants. The process of placing and restoring your dental implants is a team effort between you, Dr. Lipman, and the skilled periodontist he works with. First, you will consult together on your condition to determine where and how your implants will be placed, as well as the optimal type of dental restoration for your needs and lifestyle. If you require bone grafting, you will visit the periodontist for the procedure. After about six to nine months, you will return to their office to have your implants placed. There will then be a healing period of approximately three to six months while the implants fuse with the jawbone in a process called osseointegration. When this is complete, you will return to Dr. Lipman to have your implant restored with a fully customized crown, denture, or bridge. The process, which Dr. Lipman has done many times over, is nearly always problem-free, with a fantastic patient outcome. After your implant treatment is complete, your dental prosthetic will never slip or shift out of place. Your restoration will look and feel natural, and do anything your own teeth could—including eating foods like steak and corn on the cob. You will also be able to care for your crown, bridge, or denture the same way as your natural teeth, with simple brushing and flossing. Importantly, the implants will help retain bone mass in the jaw. Because the posts stimulate the jaw when you bite and chew, like natural tooth roots do, they signal the body to continue sending nutrients to the area. In the absence of these signals, the jawbone begins to resorb, which can lead to destabilization of the remaining teeth and a collapsed facial appearance. No other prosthetic can benefit your oral health this way. With proper care, your dental implants can last a lifetime. Dr. Lipman finds that once patients’ smiles are rejuvenated, and they can speak and eat normally again, they feel better overall and experience improved self-esteem. Implant-supported restorations can return your smile's form and function, and ultimately improve your quality of life. Contact our friendly staff for a personalized consultation today.